Bullet-proof and impervious to shellfire, a horde of the undead is about to sweep over Europe in a wave of unrestrainable death. Except no one told the Germans two things: anyone killed by the bite of a zombie becomes a zombie ... and zombies don't pick sides. To stop the Germans, an elite team of British soldiers led by Major Daniel O'Brien set out on a daring raid behind enemy lines. But in war no plan survives intact, and when the Germans lose control of their perfect weapon O'Brien's group, including two vampires and a raconteur dame, must fight their way aboard a highly-armed German airship to halt the spread of the zombie plague throughout Europe. 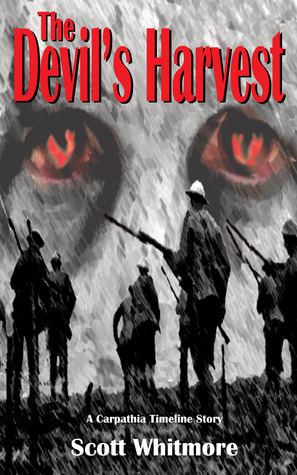 The Devil’s Harvest, an action-packed Steampunk/paranormal thriller and the second book in The Carpathia Timeline, is set thirty years after the events of Carpathia . The German major did not like the looks of the colonel who stood before him. The colonel was tall and thin, with a thin scar running from nose to ear on one side of his face. His eyes were an icy blue and his lips were twisted into a permanent sneer. The colonel’s hair was close-cropped and dark, with no hint of gray. The darkness of the man’s hair, eye color and the whiteness of his face were made more pronounced, Major Karl Kirsch thought, by the thin light in the Russian peasant’s hut where they stood. The major’s eyes dropped from the colonel back to the sheet of paper he held close to the source of the light, a flickering oil lamp. “This is signed by the chief of the Imperial Staff, and countersigned by the chief of staff for the Eastern Front and Army Group Hindenburg,” the major said, glancing again at the scrawled signatures on the bottom of the page. “And I am to give you full control of my sector for a duration of your choosing,” the major continued. Kirsch felt an initial flash of anger at the colonel’s tone, but it quickly faded. The major was dead tired, and his field-gray uniform was caked with dirt from the steppes of Russia. His unit has been on the march for weeks without a break, chasing the Russians who were in a headlong retreat to the east. Although offering stiff resistance initially, the Tsar’s army had been broken in a climactic battle near Warsaw. Metzger moved over toward a rough wooden table where a map lay, followed by Kirsch. The colonel placed a finger on a dark point several kilometers from a red grease pencil line denoting the Russians’ forward defensive position. Thoroughly baffled by the colonel’s words, Kirsch followed him out of the hut into the faint light of a pre-dawn morning. Two steam-powered trucks stood in the dusty courtyard, guarded by soldiers that Kirsch did not recognize. Tarps secured by ropes enclosed the high-sided cargo areas of the trucks. Metzger gestured toward the nearest vehicle, and Kirsch walked over to it, the guards stepping back. The major heard faint noises coming from the back of the truck: feet shuffling on the wood bed, sniffing, low moans and grunts. Curious, Kirsch reached up to undo the nearest rope, but he stopped when the nearest guard stepped to his side and placed a hand over the knot. The guard was a stone-faced sergeant who looked as though he had been in more than a few fights. Kirsch glanced over his shoulder at the colonel, who waved impatiently, before pulling his hand back and following the sergeant along the side of the vehicle. The guard turned around near the driver’s compartment and pulled at the corner of the tarp, creating a small gap. Kirsch leaned in and looked into the back of the truck. It was dark and difficult to see between the wood stakes forming the side of the cargo compartment, but Kirsch made out the forms of about two dozen men. Most were sitting on the truck bed, but two were standing. The men wore torn Russian uniforms, some with large bloodstains mixed in with dried mud. Their faces were ghostly pale in the darkness, and their eyes appeared unfocused and colorless. A foul odor reached the major’s nose, and he winced and took a step back. The back of the truck smelled like dirt, decay and death. The guard closed the gap in the tarp and Kirsch walked over to where the colonel stood. Metzger nodded at the sergeant before turning on his heel and walking back into the hut. Kirsch followed and found the colonel near the iron stove, pouring himself a cup of coffee from a chipped blue enamel pot liberated from the hut’s previous owners. “I see,” the major replied, although his tone clearly indicated otherwise.